Hello there, and welcome to all you stuck up, half-witted, scruffy-looking Nerf herders. Way back (well it feels way back) when Disney acquired the rights to a galaxy far far away, they made it clear that not only would there be a sequel trilogy heading our way but, anthology movies as well. The possibilities are endless, there are some many stories from the Star Wars that can, and should be told. Disney also made it clear that it won't only be new theatrical releases we can expect to see. New Star Wars stories will be told across all forms of entertainment. Which brings us nicely around to the topic of this week's ramblings. With the astronomical success of Rogue One, fans from our beloved community have been sharing their wish-lists for anthology stories they are begging to see. But, what about another popular form of entertainment? what about the video games we need? 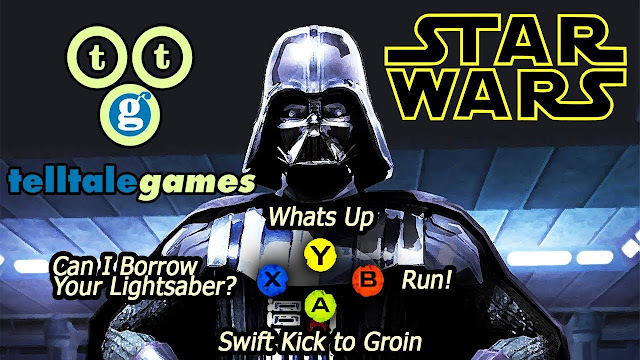 well here are the top 5 video games we as Star Wars fans need. 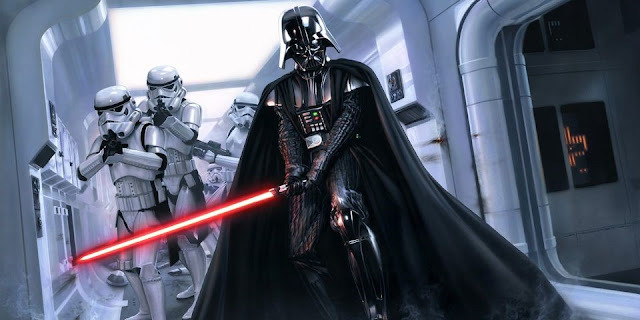 A Darth Vader stand alone movie is one of the most popular suggested stories for the Anthology films. I agree that a movie based solely around the Dark Lord of the Sith himself would be incredible. The end scene in Rogue One perfectly showcasing why this would be an exceptional choice. A tale about how Vader hunted down the remaining Jedi during the height of Imperial rule would be a dream to watch yes but, imagine actually controlling Vader during his purge. Third-person adventure games are some of the most popular titles released. Games such as The Last of Us, Uncharted, and Tomb Raider have garnered critical acclaim and have sold millions of copies around the globe. These games have shown that it is possible to combine a 'Hollywood-esque' story with solid and enjoyable action. Developers Naughty is are the undisputed king in many gamer's eyes in this genre due to the aforementioned Last of Us and Uncharted. Star Wars: The Force Unleashed was a teaser as to how incredible a Vader game would be as the opening level puts you in Control of Vader on Kashyyyk hunting down a Jedi master who escaped the events of Order 66. We could see Vader hunting Jedi on numerous popular planets in the Star Wars universe. Just imagine, you as Vader, slicing you way through a barrage of rebels protecting the secluded Jedi master. Perhaps, accompanied by the loyal men of the 501st? Squad orders are nothing new in video games so ordering the troops of Vader's Fist to take care of the remaining rebel troops while you make your way to put an end to the Jedi would be an easy mechanic to include. A stand alone Vader game, I hope you agree, would be incredible. Now I'm not suggesting some sort of crazy mashup where the Dovahkiin goes to battle against the Empire, more so an RPG in the style of Bethesda's mammoth release. Star Wars RPGs are nothing new of course. 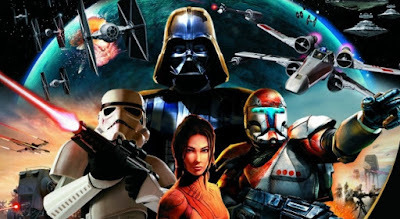 The Knights Of The Old Republic games, although old, are still easily playable and, if for some bizarre reason you have never played them, do it! A Skyrim styled RPG would be vastly different to what we have seen before. There will be total freedom to go and do exactly what you like. Running along the main quest will be numerous side quests, along with those side quests there will be individual quests and, along those, there will be 100s of places to explore and characters to meet along the way. Long story short, there will be a seemingly endless amount of content and a vast world to explore. Skyrim, coming up to six years after it's release, is still one of the most popular video games around. If we take Bethesda's formula and mix it with a galaxy far far away, it would create one of the most popular video games of all time. Would it work as a force user as the main character? absolutely as the Elder Scrolls series has always utilised magic in their gameplay mechanics. In terms of settings, what would work best? alongside one of the movies? in between them? For me, personally, I would love to have this set before Episode I. I want to be in the time where Palpatine is under the tutelage of Darth Plageuis, where Count Dooku is Yoda's padawan. There could be some really interesting stories told around this time. 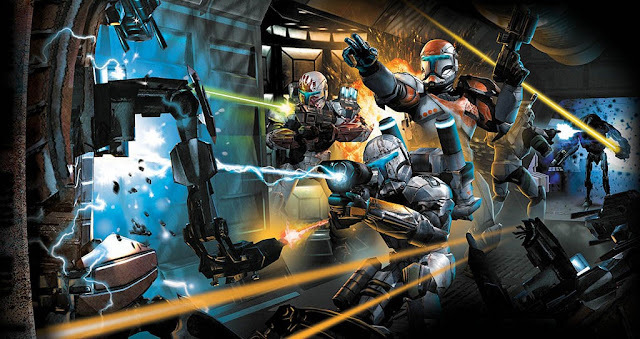 The first Republic Commando was incredible. It is a blast to play now even though it was released all the way back in 2005. It was a solid first person shooter which featured an incredible HUD (heads up display) of a Clone Commando's Helmet (a particular highlight being the visor being wiped clean after getting some Geonosis guts all over it) and a solid squad command system. The action was well paced out and the enemies challenging but never frustratingly difficult. The downside? it wasn't very long. Today in gaming, first person shooters are perhaps the most popular genre of gaming. Games like Call of Duty, Battlefield and, of course, Battlefront dominate the charts year in, year out. The quality of the gameplay now in shooters is remarkable. The stories behind the action are equally as sophisticated and drive a player on. A sequel to Republic Commando is a must. There was a planned sequel, Imperial Commando but, this never got past the concept art stage. A perfect sequel setting for this fantastic game. We can witness the events of Order 66 first hand, possibly even participate in the great Jedi purge. Or, like Captain Rex, would Delta Squad refuse these orders? and go on to protect as many Jedi as they can from the Imperial war machine? If you're not familiar with the Telltale games, they play out as a 'choose your path' adventure book. They offer the player numerous choices to take your story exactly where you want it to go. What better game system to use for a tale of a Jedi Knight, tempted by the Dark Side of the Force. The fact there hasn't been a Star Wars Telltale game yet is quite frankly, deeply upsetting. It is tailor made for a Star Wars tale of temptation, redemption and betrayal. Telltale games are not renowned for their action so this will solely be focused on a story. Marvel, DC, Game of Thrones and other huge franchises have all gotten the Telltale treatment before and have all been met with critical acclaim. With a franchise as rich, story-line wise as Star Wars, this really is a no-brainer. It was 2003 the last time we were treated to a new Rogue Squadron game. That is far, far too long! Rogue Squadron II and III were exclusives to Nintendo's gem of a console, the Gamecube. With this in mind,, perhaps a Rogue Squadron IV could be an exclusive on the Nintendo Switch. If this would be the case then that means one thing...MOBILE SPACE BATTLES! Suddenly a two-hour flight doesn't seem that bad if you are locked in a battle with the Empire's finest pilots. There would obviously be a bit of an outcry from gamers who have not been convinced enough to purchase Nintendo's latest console. A cross-platform release is extremely feasible with many top games being released on all three consoles. Both previous Rogue Squadron games covered the Original Trilogy pretty extensively so perhaps a new setting would be best. To coincide with the upcoming Battlefront II, how about an after Jedi setting? or go right back to the formation of the Rebel Alliance. Jump into the cockpit of an X-Wing in the early days of the rebellion and be a part of those early strike teams. Maybe a certain light-freighter involved in these early strikes could make an appearance? Are there any other games you'd like to see? let us know in the comments below. Remember, Peace is a lie and, May the Force be with you. You seem to forget to mention that way back in 2003 Star Wars Galaxies a MMO was one of the biggest games played and had 1000's of people playing that from all over the world and what SONY did to it was like mass murder. SWG 2 should be a new engine MMO with todays graphics, SWG was a game of total freedom and a community of thousands. A SWG 2 would be awesome. Star Wars Uprising MMO set following ROTJ! It was done as a mobile game why not bring it to console? Yes please. To all of these. I especially like your Skyrim idea. And my brother really wants a sequel to Republic Commando. Actually, I know of a lot of people who would like that. Neat article! 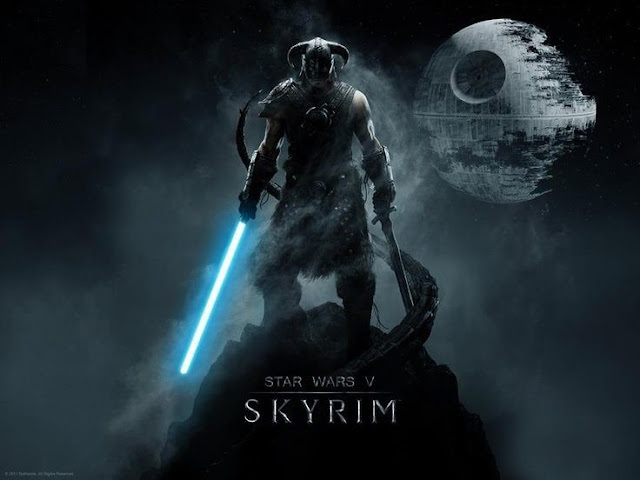 I've contacted Bethesda multiple times asking how hard would it be for them to make a skyrimesque Star Wars and they said when George Lucas owned the films it would have been pretty easy because the EU was canon but it wouldn't be viable now because their isn't a large enough canon to do so. Reboot X-Wing and TIE Fighter. Gotta second rebooting X-Wing and TIE Fighter. As a teenager my three favorite SW games were X-Wing, TIE Fighter and Shadows of the Empire. I want a game that's basically the old Battlefront II campaign, but with a branching storyline where there are consequences to winning or losing battles. What if you play as Separatists and win the Clone Wars? What if the Death Star manages to destroy Yavin IV? The game we REALLY want is "Death Star Commander", where you travel around the galaxy annihilating rebel bases and planets. Just remember to board up that exhaust vent first.